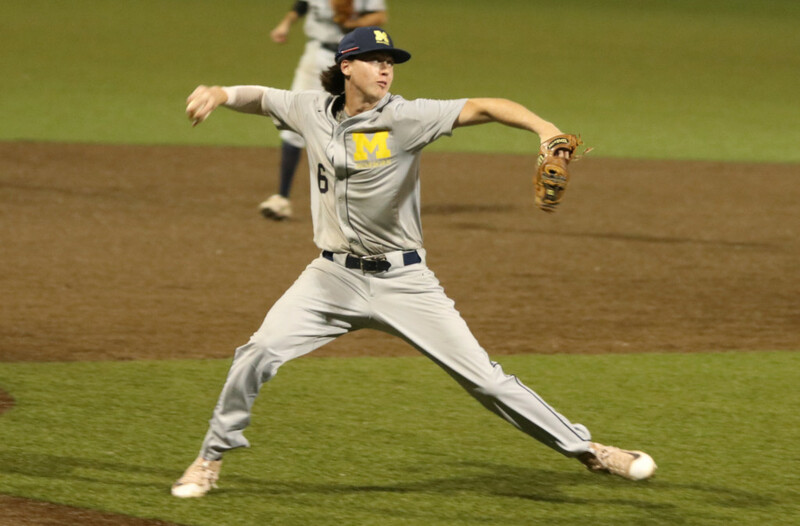 The University of Michigan-Dearborn baseball team opened their fall season with three games against Lourdes University. The Wolverines lost all three games played, 3-13, 8-9, and 2-6. The men’s team was competitive against the Gray Wolves, which was encouraging for the first weekend in the program’s history. The first game on Saturday saw freshman pitcher Alex Leija take the mound early and pitched 2.2 innings. He gave up a hit and 5 runs. He also walked 8 batters and struck out 3. He was replaced by junior pitcher Nick Montroy, who pitched for 3 innings and gave up 8 hits and 6 runs. He also struck out a batter and walked 4. He was relieved by sophomore pitcher Justin Marshall who pitched for 2 innings and gave up 2 hits, 2 runs, a home run, and walked one. Chase Turner, Cole VanWagoner, and Matt Buhagiar scored runs for the Wolverines. The team also had 6 hits, 3 walks, and 7 strikeouts. The game lasted 8 innings. The second game on Saturday saw freshman pitcher John Dyda take the mound and pitch for 6 innings. His struck out 7, walked 1, gave up 11 hits and 6 runs. Freshman pitcher Ramiro Rodriguez was next up for the Wolverines and he pitched 1.2 innings. He struck out 3, walked 1, gave up 2 hits, and 2 runs. Freshman pitcher Cameron Winn pitched the final 2 innings. He struck out 3, walked 1, gave up 3 hits, and 1 run. Chase Turner, Andrew Capone, Shaun Hannibal, Justin Dolney, Cole VanWagoner, and Dan Bos all scored runs for the Wolverines. The team also had 11 hits, 4 walks, and 5 strikeouts. The game lasted 10 innings. The third and final game of the weekend was played on Sunday. Freshman Dan Bos opened the game as pitcher for 3 innings. He struck out 1, walked 5, gave up 6 hits, and 3 runs. He was relieved by Matt Buhagiar who pitched 4 innings. He struck out 2, gave up 5 hits, and 3 runs. The final pitcher of the weekend was Cameron Winn who pitched 1 inning. He struck out 1, and gave up 1 hit. Cole VanWagoner, and Andrew Capone recorded the only runs for the Wolverines. The team also had 9 hits, 2 walks, and 8 strikeouts. The game lasted 8.5 innings. The next set of games is on Saturday at home versus the University of Northwestern Ohio. This will be a double header with a third game on Sunday Oct. 1.